SecureVideo - VSee: How can I diagnose my equipment and connection? Viewing your network statistics during a video session can be useful in determining if your hardware and/or internet connection are optimal for holding your sessions. There are many different factors that contribute to the quality of your videoconference, and one way to determine the best way to increase that quality is by checking your user statistics while in a session. If you're on a Windows desktop or laptop, click on your own video tile, and then hit the keys Control (CTRL) and I (the letter "eye"). If you're on a Mac desktop or laptop, click on your own video tile, and then hit the keys Command (Apple key) and I (the letter "eye"). The first line of these statistics note that you are sending 438 kbps and receiving 436 kbps. These numbers indicate how much data (in kilobytes per second) your computer is sending to the other person in your session, and how much data you are receiving from them. 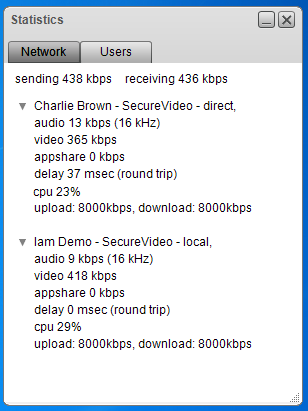 Data includes your video, your audio, any screensharing, or any files you might be sending. Iam Demo - SecureVideo - local: This is "your" account name. You can also tell it's yours because the word local comes after it. Your own device is always the local one. audio and video: This indicates how much audio and video data you are sending (in kilobytes per second). Added together, this is normally the same as the total amount of data indicated in the first line (but will be different if you are also sharing a screen/app, or sending files). cpu / audio cpu: "cpu" stands for "central processing unit". The percentage of cpu that you are running indicates how much of your computer's capacity to run tasks are currently being used. UDP relay: indicates you are on a private (password-protected) network, and the program needs to use Network Address Translation to allow you to connect. TCP relay: indicates that one or more necessary ports are being blocked by your network firewall. (See this article for more information.) This type of connection results in lags, as it will pause to recover any dropped data packets instead of simply skipping them. 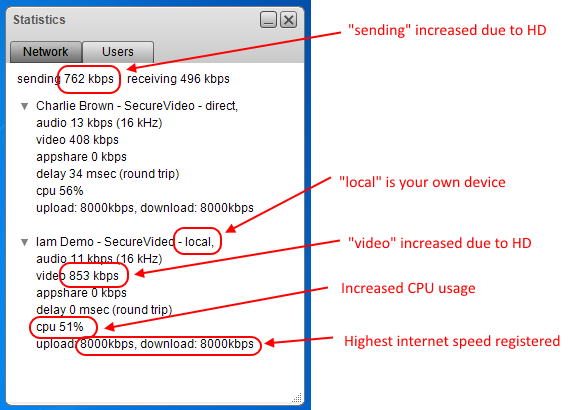 Not only are you now sending a lot more video-data, your CPU percentage has increased. However, the delay experienced by your session participant has not increased; both of you had computer processors and an internet connection that could handle the higher data levels. How can I use these statistics? You can use these statistics to determine the best way to increase the quality of your videoconference. your download speed (bottom row, right) is equal to or greater than the amount of data you are receiving (top row, right). The amount of data you are sending and receiving will fluctuate throughout the call, but should stay above 200 kbps for good quality video (at a low video quality setting, you may drop the number to about 100 kbps). Because you want to be sure you have some buffer, we recommend that your internet speed is at least 1,000 kbps (upload and download). Using an ethernet cable instead of a wireless connection can increase your internet speed. Using a home or business internet connection will usually give you a faster and more reliable connection than 3G, 4G, or a public internet connection. 2. CPU: If your CPU is running high (over 60%), this could affect your computer's ability to display video and run the videoconferencing program, resulting in delays or pixelation. If your CPU is over 80%, you may not be able to videoconference. Close as many background applications as you can, which will free up your computer's capacity for tasks. Upgrading your computer's Random Access Memory (RAM) by installing additional memory modules can increase the capacity of your computer to multi-task. This article was last reviewed by our Support team on March 25, 2015.